After the great success of the previous eLFA 2016 in Shanghai, we are pleased to announce the Tenth eLearning Forum Asia 2017 (eLFA 2017). This conference is an excellent forum for researchers and practitioners from Asia and beyond to present their projects and share their knowledge on educational innovations. 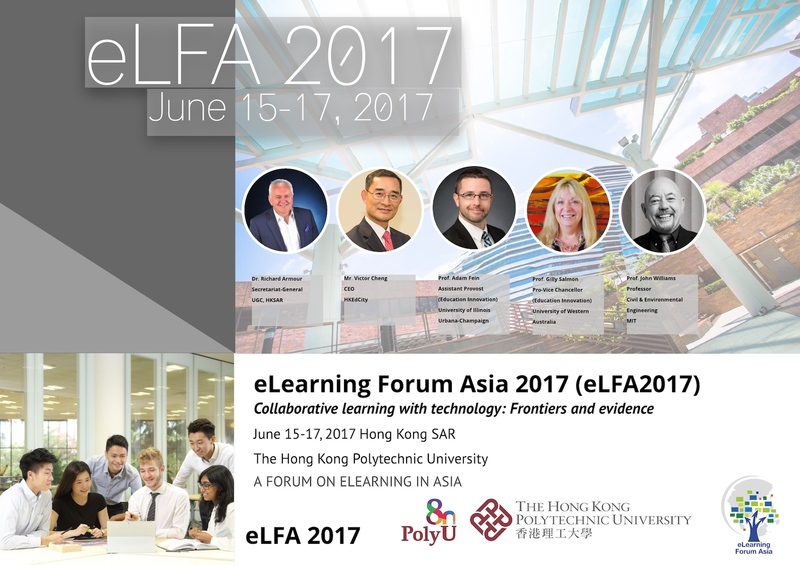 The eLFA 2017 conference will be held on June 15-17, 2017 at The Hong Kong Polytechnic University (PolyU), which has been recently ranked as the 6th on the QS (Quacquarelli Symonds) Rankings “Top 50 under 50” list of university. Notifications of acceptance/rejection of the abstracts submitted will be sent to you via email by April 10, 2017. Selected full papers will be featured in an upcoming special issue on Education Sciences, an international, peer-reviewed open access journal (http://www.mdpi.com/journal/education) indexed in Google Scholar (https://scholar.google.com), ERIC – Education Resources Information Center (ERIC) (http://www.eric.ed.gov/), & DOAJ – Directory of Open Access Journals (http://www.doaj.org/). If you wish to be a session chair, please email your request to elfa2017@elfasia.org and indicate the topic area in which you are interested. The author(s) will be required to deliver a PowerPoint presentation of their research work on the conference day. Please bring along a soft copy of your presentation in a USB thumb drive. We strongly recommend bringing a back-up or emailing yourself a copy in advance in case of technical issues. You will be allocated a 20 minute slot, please take care not to exceed it. We suggest to aim for a 12-15 minute presentation, so that there will be time for Q&A. Your presentation should be interesting, informative, well-paced and lively. Posters will be hoisted on standard R8 exhibition panel with measurement at 2.15m (H) x 1m (W). Presenters are required to bring their own adhesives (e.g. Blu-Tack) to affix their poster to the display panel.